The Aurora Borealis, Northern Lights, Merry or Heavenly Dancers are a celestial light show that many are aware of but accept they will never see, especially in the UK. I hope that in the next few years this myth will be dispelled as awareness about them increases thanks to developments in digital photography, both still and moving. The recent programme about Johanna Lumley’s search for them in Norway certainly highlighted the phenomenon with some wonderful moving imagery although it still left the ordinary Briton thinking that they too have to travel further North to see them. Not so, in the next three or four years, as the new sunspot cycle increases in activity, I hope that there will be displays visible over the whole of the UK and many more people will have the pleasure of observing them. The visibility of the Aurora over a wide part of the UK on occasions has always been the case, but I suspect many would not even think about expecting to see them, so they will not look often enough to stand much chance of observing them. In the past there was no warning of displays, but, with the advent of satellites, NASA can now give a warning of around nine days, your first port of call is the website, SpaceWeather.com where anything to do with space is dealt with in very understandable terms and it has some spectacular photo galleries as well. Although aimed and centred around North America the data is easily transferred to the European sphere by a useful Aurora Oval map down the left hand side. Coming nearer to home, there is AuroraWatch, operated by SAMNET out of Lancaster University, with data collected from a magnetometer situated literally in my back garden, 25 miles west of Aberdeen. This site, although not predictive, can offer a texting alert service which means that when there is severe disturbance in the Earth’s magnetic field there is the likelihood of an Aurora display. If you think it is a rare event, then think again  I have photographed over 350 displays between 1989 and December 2006, when the 11 year sunspot cycle went into decline. Some of those displays, called Coronas, seen over my location in Aberdeenshire, were also seen as lesser displays deep into England and on a couple of occasions even reached the Channel. So, with the above two internet sites there is no reason why any observer in England cannot be aware of a likely disturbance and get to a dark area with a clear, unpolluted view to the north and stand a high chance of seeing a display. At the most active phase in the last maximum of the solar cycle, my experience was they could appear for three nights in a row, twice a month and in March 1989 I saw Aurora displays, seven nights in a row. 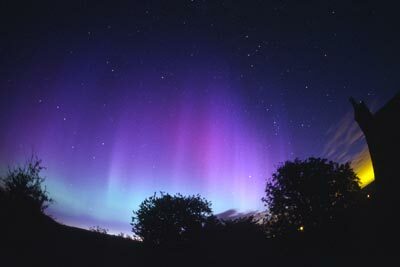 The British Astronomical Association keep a detailed record of all Aurora reports from astronomers and pilots around the world and certainly I noticed that if I saw an Aurora over the North East of Scotland, even fairly ordinary ones, then they were observed at least as far south as Northern England. The key elements for seeing displays are dark, clear nights i.e. free of cloud or low lying mist. Frosty nights are usually ideal for seeing them but they are not dependant on temperature, some of the photographs on the Collections site are taken in the summer on very temperate evenings. Avoiding light pollution is probably the greatest problem and it is preferable to be on high ground looking across towards a northerly horizon line; looking north towards nearby high hills and forests could obscure the rays of lower grade displays. Colours are visible, although in the early part of a display the Arc is often just a pale band of light, like a flattened rainbow and the only colour is pale yellow or white with a bluish hue which waxes and wanes. Once a display becomes active, with large rays bursting upwards from the arc, then the early colour tends to be green, which is low atmospheric level oxygen gas, later, as the power increases, high level oxygen gets excited and gives off a distinctive red colour. The colours in photographs tend to be over-saturated owing to the length of exposure, so always understand you will not see the colours that strongly. 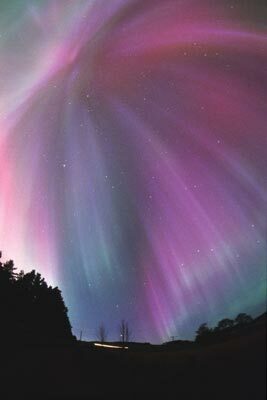 The big give away for Aurora is the continuous movement and the scale, with rays often going from the horizon up into the night sky as high as straight overhead, in the case of a Corona, as well as moving sideways. This crown-like effect, with rays dropping often 360 degrees all around the observer, exhibits the strongest colours, with red, green and occasionally the purple of nitrogen gas and various combinations of these. The Aurora colours are not the same as the spectrum seen in rainbows, which is caused by sunlight reflected through water. The hanging curtains or drapes from a folding arc are not so common in UK displays, but are more part of the far north displays, because of the greater power near the polar regions, to which the charged particles are initially attracted. If you do go out to observe the Aurora, then give your eyes a good 20 minutes to adjust to the night sky and just use your eyes  binoculars and telescopes are pointless for this celestial event. 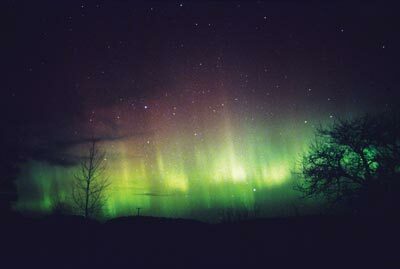 The electrons from the solar radiation charge up the gas molecules and the resultant discharge causes the colours (like in a neon tube) and the large disturbances of the Earth’s magnetic field cause the perpetual motion, it is this vast sky-covering display that makes it stand out from anything else you are likely to see in the normal night sky. A good marker for seeing them in the late autumn and early winter is The Plough constellation (Ursa Major/Big Dipper) and in the early part of the year it is Cassiopeia, a constellation of five stars strung like the letter W.
Photography is about as simple as it gets and the following applies to digital as well as slide film or negative. You can take this as a basic formula which I have found works best over many years and Aurora’s, make your own adjustments according to your camera system and lens. A wide angle lens (28-20mm) at f2.8 with ISO (or old ASA) rated at 1600 with around 15-20 seconds exposure. Focus on infinity with the lens wide open, camera on a tripod and use a locking cable release or the like. Always check your focusing periodically as it is easy to move whilst turning the camera for landscape or portrait, tilting higher, pointing straight up or moving to follow ray activity  as the depth of field is so shallow, getting out of focus images is all too easy. Also periodically make sure the aperture is still wide open. Spare batteries are vital on frosty nights as it is best, I have found, to leave the camera out, even if cold, as bringing it indoors and then taking out again causes condensation, cover it with a plastic bag if showers threaten, check the lens perodically (a penlight torch is useful) as sometimes air temperature or moisture content changes suddenly and the lens mists over. It is easy to get so excited and carried away that the basic checks get forgotten about. Point at the Aurora & shoot. Remember they are all different so any photograph you take will be unique, each and every time, quite apart from the unbelievable beauty of them.